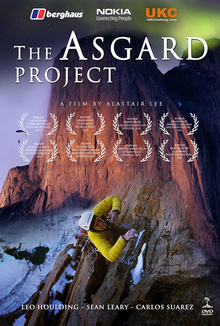 WINNER of 22 INTERNATIONAL AWARDS; The highly acclaimed all action Asgard Project from 2009 reset the standard for adventure film making. The film follows Leo's ambitious project to make a first free ascent on the North Tower of the incredible Mt Asgard on Baffin Island deep in the Arctic. Leo teams up with fellow big wall climbing god, Stanley Leary (USA), the duo hope to make a wingsuit descent from the summit. Arriving late in the season the trip soon begins to go wrong, after a spectacular arrival skydiving over Mt Asgard, conditions turn against the team where just reaching the base of the climb becomes a massive challenge. The film produced by multi-award winner, Alastair Lee, is an all out spectacular documenting a truly cutting edge adventure with all its twists and turns. Prior to the Baffin trip we embark on training trips to Riglos, Brento in Italy and El Cap in Yosemite. Purchase all four big walling films in this super bundle of epic adventures from the Arctic, the Amazon, Antarctica, and Yosemite. $25 (RRP $70).